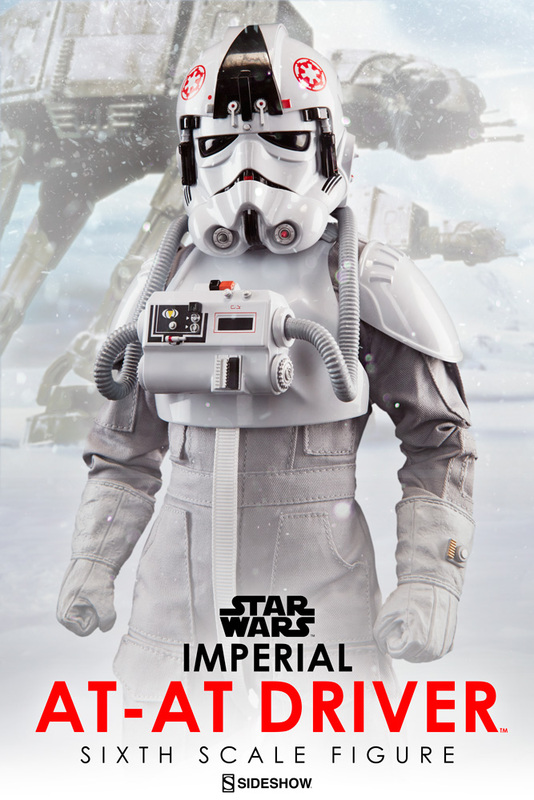 From Star Wars Episode V: The Empire Strikes Back, Sideshow Collectibles is proud to present the Imperial AT-AT Driver Sixth Scale Figure. Most famously remembered from the Battle of Hoth, specially trained AT-AT drivers took control of the Empire's massive All Terrain Armored Transport vehicles - or Imperial Walkers - in a devastating ground attack against the Rebels at Echo Base. 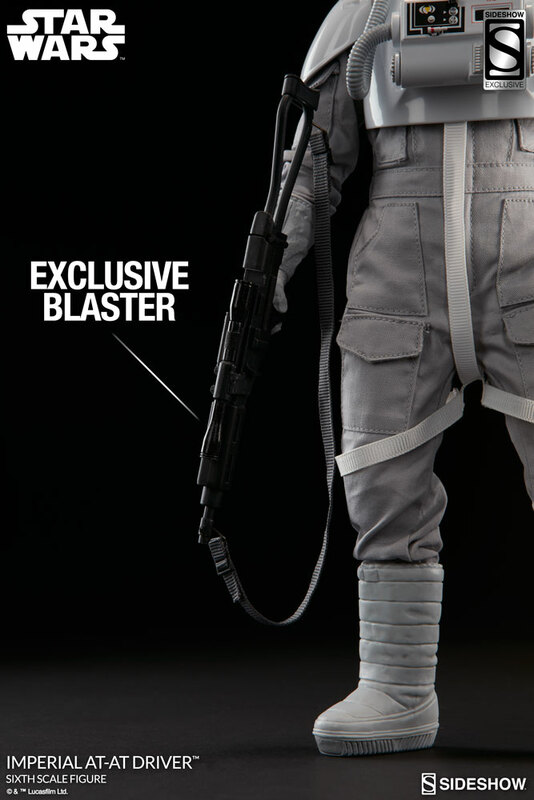 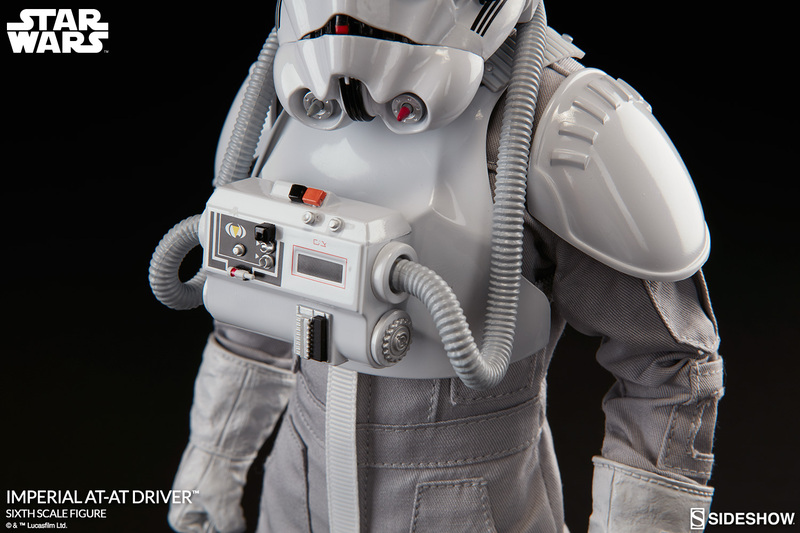 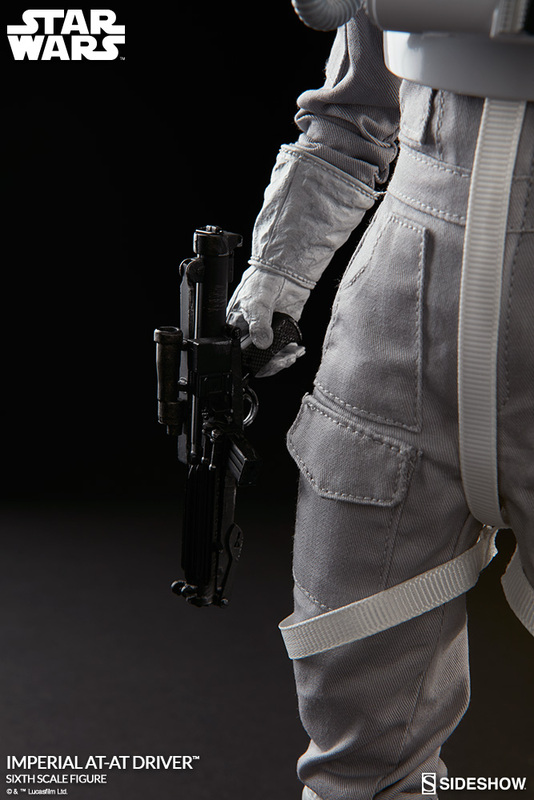 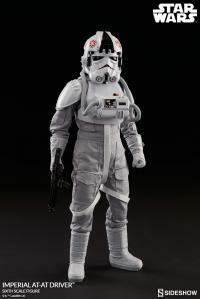 Suited for cold climate battle, the AT-AT driver comes fitted in a standard-issue uniform, featuring a streamlined helmet connected by pressurized hoses to a life support system, and glossy white armor over a pristine grey flight suit. 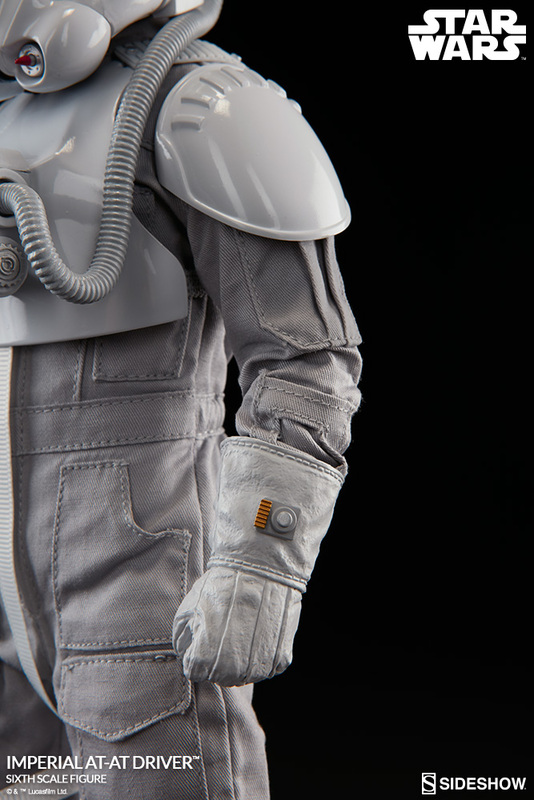 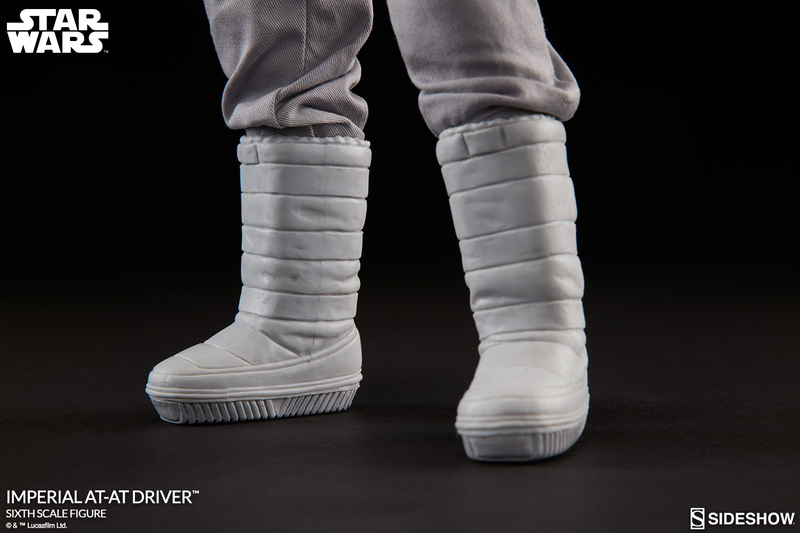 Interchangeable driving gauntlets feature a com-link and allow dexterity for handling AT-AT controls while positive gravity pressure boots keep him grounded in all situations. 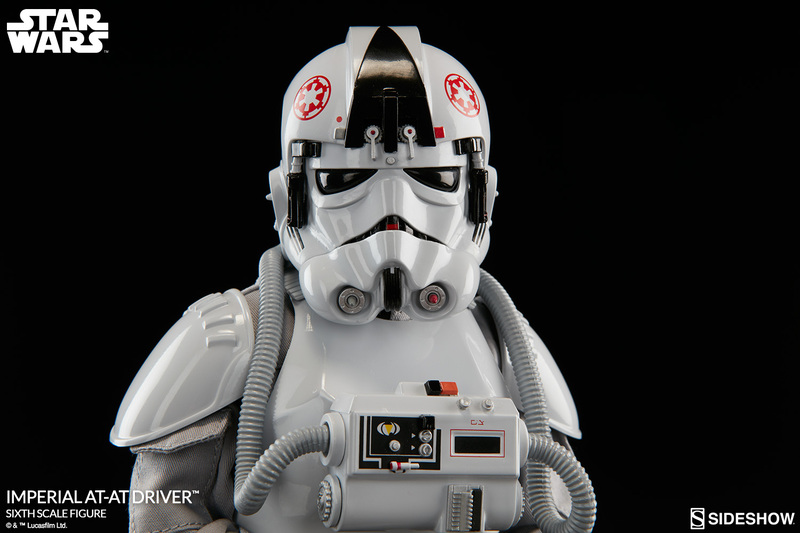 Ready to serve the Galactic Empire with honor and distinction, the Imperial AT-AT driver is an exceptional addition to any Star Wars military collection! 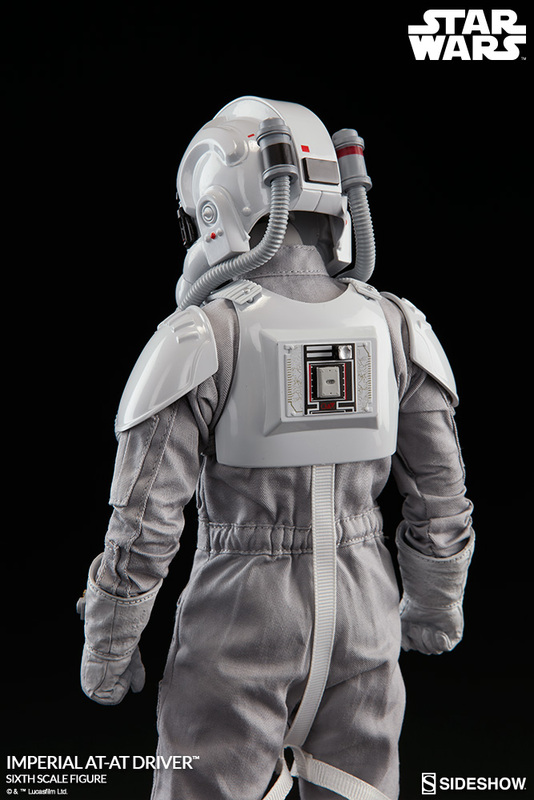 Suited for cold climate battle, the AT-AT driver comes fitted in a standard-issue uniform, featuring a streamlined helmet connected by pressurized hoses to a life support system, and glossy white armor over a pristine grey flight suit. 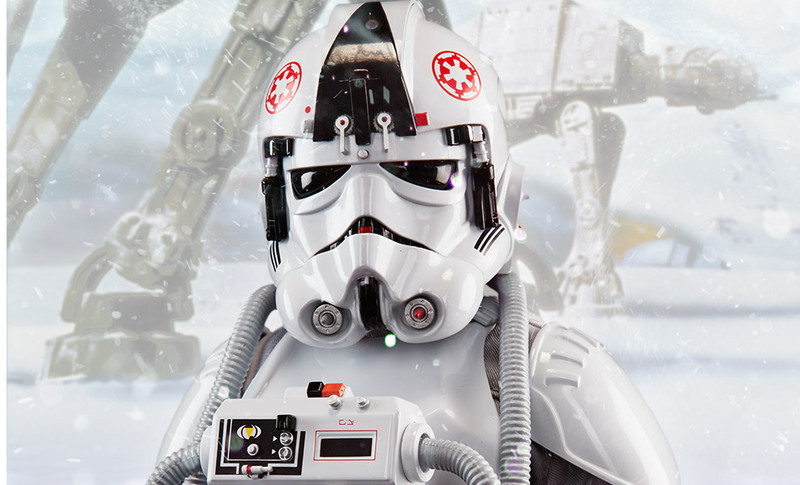 Interchangeable driving gauntlets feature a com-link and allow dexterity for handling AT-AT controls while positive gravity pressure boots keep him grounded in all situations. 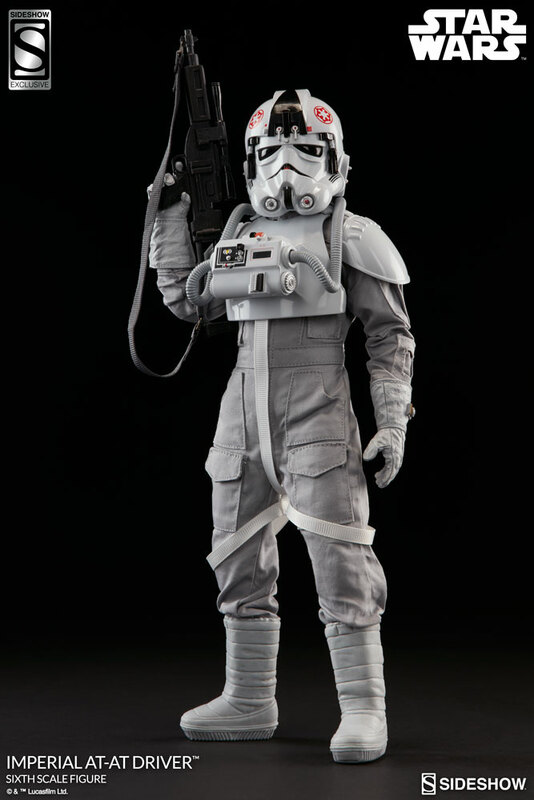 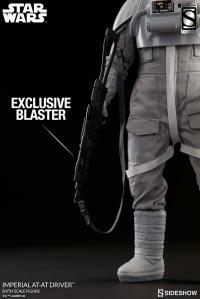 Although typically found in the cockpit, Sideshow's Exclusive Imperial AT-AT driver also comes armed with a vintage inspired rifle blaster - a nostalgic feature Star Wars collectors are sure to enjoy. 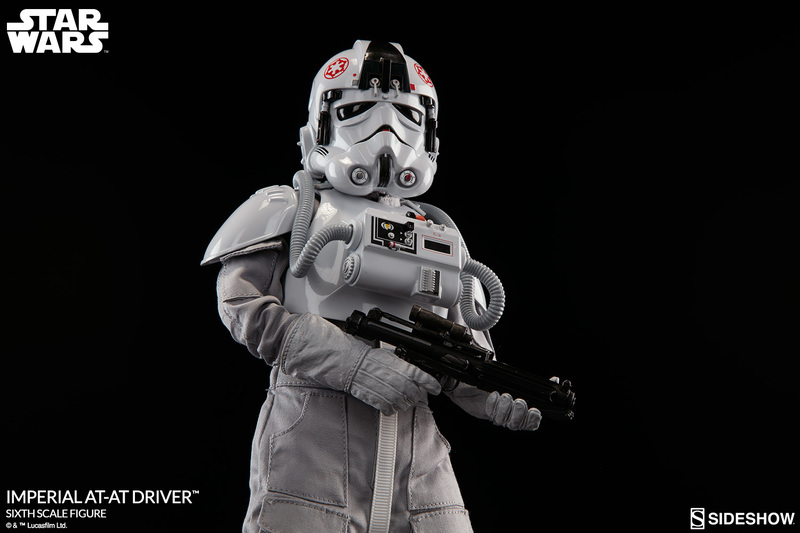 Ready to serve the Galactic Empire with honor and distinction, the Imperial AT-AT driver is an exceptional addition to any Star Wars military collection! 1st purchase in a long while, but not the last! 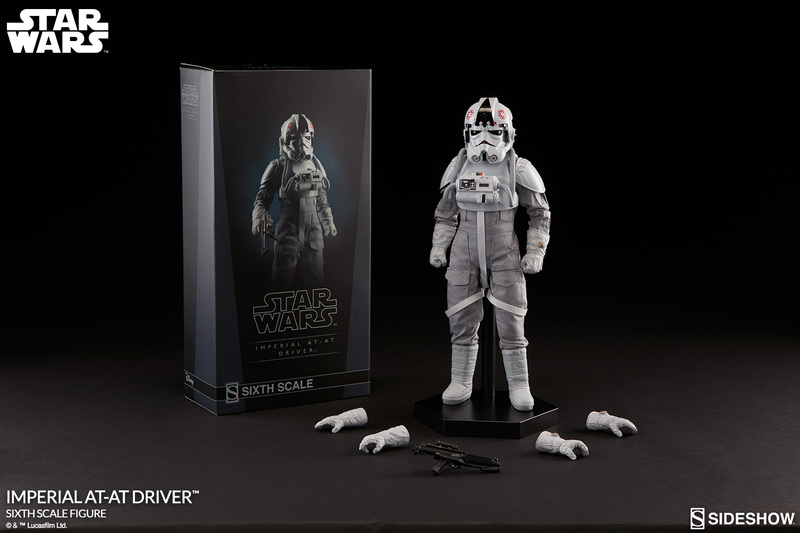 WOW been waiting a long time for this figure , amazing detail and looks great with my other SS figures , dont miss out on this AT AT driver your be sorry if you do ! 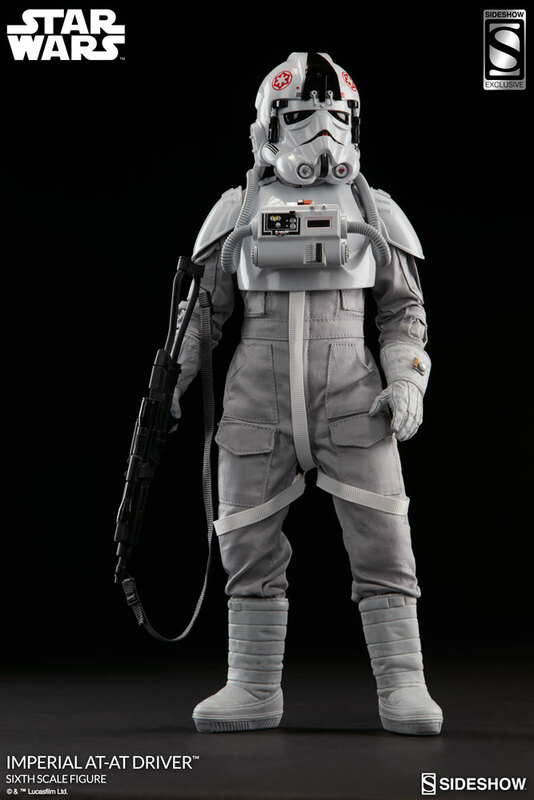 I got this figure because the scene in the ESB when they appear is so awesome, and I'm not disappointed. 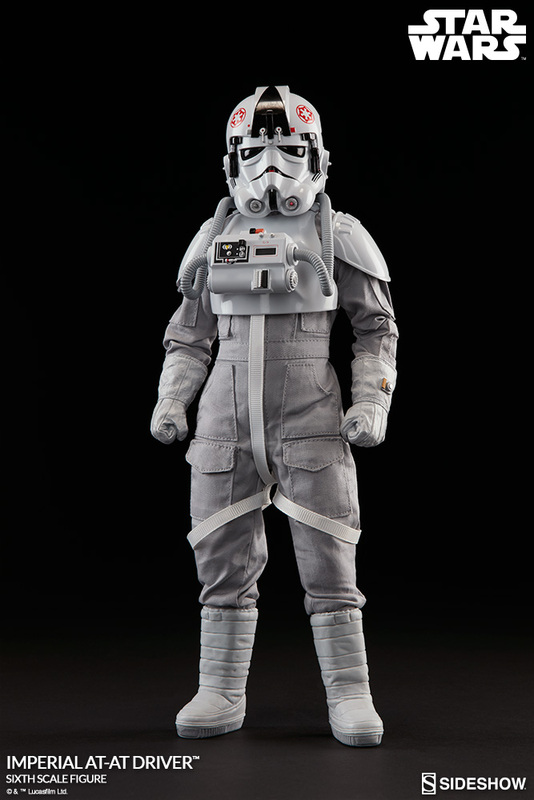 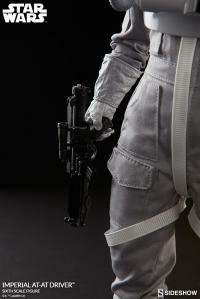 Highly detailed helmet, finely crafted suit, very similar to the TIE Fighter Pilot figure outfit, and poses quite easily. Great figure.